Swati and Vijay, well-known for their street graffiti, take a dig at the corrupt politicians through their painting. District administration officials in Telangana are leaving no stone unturned to ensure maximum polling in the upcoming assembly elections on December 7. While there has been an increasing awareness among voters about the importance of casting one’s vote, city based artist couple Swati and Vijay, are wielding their paintbrush to show people the futility of elections that elect representatives from political parties, who according to the couple, more or less remain indifferent to the voters’ plight every single time. 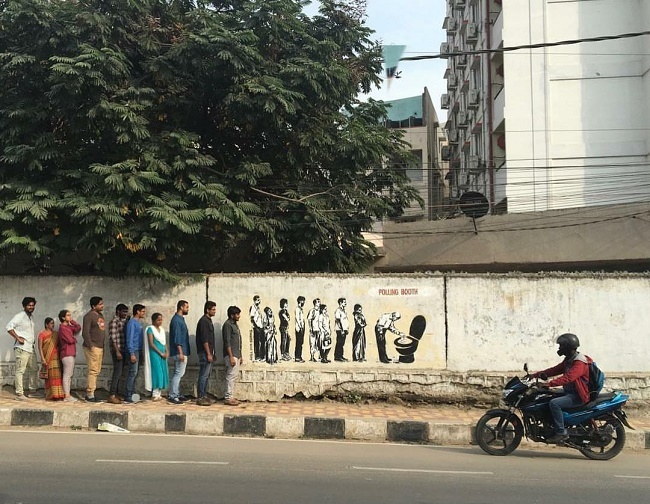 In a painting that has cropped up on the government high school wall in Gachibowli, Swati and Vijay have sketched a queue of voters lined up outside a polling booth waiting to cast their votes, as the man leading the queue casts his vote into a commode. Swati and Vijay, whose distinctive signatures mark the creative graffiti around the streets of Hyderabad, had received much appreciation for giving an artistic makeover to the schools in Telangana’s villages which were under the grave threat of closure due to high dropout rates in the past two years. Visibly upset with the political system in the country, the couple opines that election is a futile exercise as it only offers a list of corrupt politicians for the voters to choose from. “I do not want to give any message to the public because they are very well aware of their rights. We need to have better candidates among whom the voters can choose wisely and cast his/her vote. So my target audience this time is the election commission,” Vijay says. Vijay says that while one can say that the painting is a reminder asking people to think and vote wisely and choose the right candidate, it mainly speaks as a criticism of the government and mocks the election commission, which does not have much to offer to the people apart from 4-5 candidates, mostly infamous for their criminal records. The couple says that soon after they finished the painting, people on the streets approached them and they recreated the queue that could be seen in the painting, and clicked a photograph. “We painted it on a government high school wall as it would soon turn into a polling booth next month,” Vijay says. Telangana is all set to go to polls on December 7 and the counting is to be held on December 11. A total of 1,824 candidates are in the fray in the upcoming Telangana Legislative Assembly Elections. According to Chief Electoral Officer Rajat Kumar, the total number of voters in the state is 2,80,64,680 including 7,46,077 new voters.